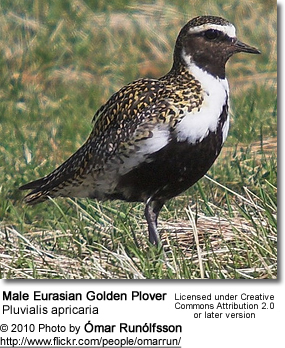 Plovers are wading birds that are found throughout the world. They belong to the subfamily Charadriinae. Most of the members of this species are referred to as "plover" or "dotterel". 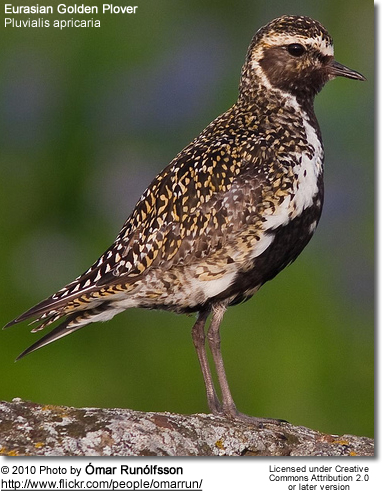 These birds are characterised by relatively short bills. Their diet consists of insects, worms or other invertebrates. Characterized by the distinctive partial or complete chest bands or collars seen in many of the subspecies. Long-billed Plover, Charadrius placidus : Found in Bangladesh, Bhutan, Brunei, Cambodia, China, Hong Kong, India, Indonesia, Japan, North Korea, South Korea, Laos, Malaysia, Mongolia, Myanmar, Nepal, Russia, Sri Lanka, Taiwan, Thailand, and Vietnam. Black-banded Plover, Charadrius thoracicus : Also known as Madagascar Plover. Endemic to Madagascar. Inhabits subtropical or tropical mangrove forests, sandy shores, intertidal marshes, and coastal saline lagoons. Javan Plover, Charadrius (alexandrinus) javanicus : Endemic to Indonesia. Its natural habitats are sandy shores and intertidal flats. Chestnut-banded Plover, Charadrius pallidus : Found in Angola, Botswana, Kenya, Mozambique, Namibia, South Africa, Tanzania, Zambia, and Zimbabwe. Puna Plover, Charadrius alticola : Found in Argentina, Bolivia, Chile, and Peru. Inhabit freshwater lakes and saline marshes. Two-banded Plover, Charadrius falklandicus : Found in Argentina, Brazil, Chile, Falkland Islands, South Georgia and the South Sandwich Islands, and Uruguay. Inhabit freshwater lakes, saline marshes, rocky shores and sandy shores. Rufous-chested Dotterel, Charadrius modestus : Found in Argentina, Brazil, Chile, Falkland Islands, Peru, Saint Helena, South Georgia and the South Sandwich Islands, and Uruguay. Inhabit temperate grassland and sandy shores. 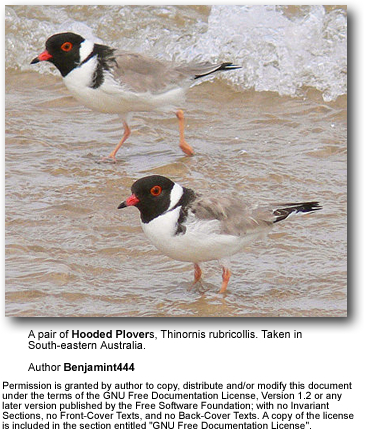 Hooded Plover, Charadrius rubricollis : Endemic to Australia. Associated with freshwater lakes, freshwater marshes, and coastal saline lagoons. Shore Plover, Thinornis novaeseelandiae : Its Its Māori name is Tuturuatu. Endangered species that is endemic to New Zealand. Total world population is believed to be around 200 birds. 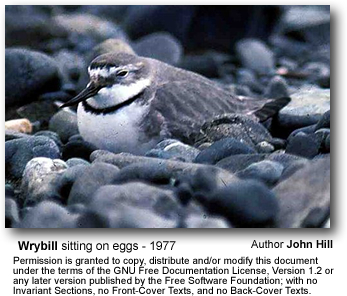 Wrybill, Anarhynchus frontalis : Also known as Ngutuparore (Māori) Endemic to New Zealand. This is the only species of bird in the world with a beak that is bent sideways (almost always to the right). Diademed Plover, Phegornis mitchellii : Found in Argentina, Bolivia, Chile, and Peru. Inhabits subtropical or tropical high-altitude grassland and swamps. Tawny-throated Dotterel, Oreopholus ruficollis : Found in Argentina, Bolivia, Brazil, Chile, Ecuador, Falkland Islands, Peru, South Georgia and the South Sandwich Islands, and Uruguay. Inhabits subtropical or tropical dry shrubland, temperate grassland, subtropical or tropical high-altitude grassland, and pastureland.